Prim Perfect are hosting a series of regular talks and discussions at the SL Christmas Expo. 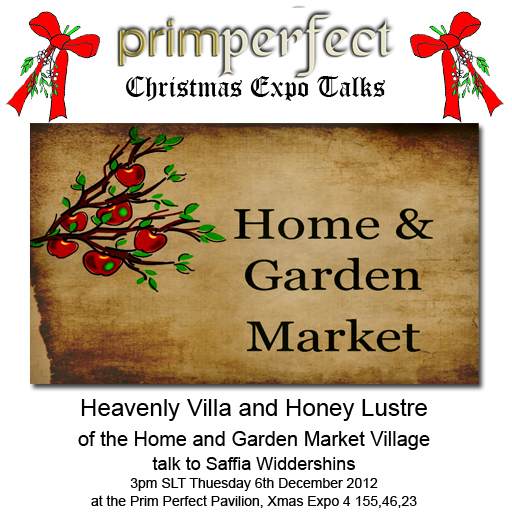 Today at 3pm SLT in the Prim Perfect Pavilion, Saffia Widdershins will be in conversation with Heavenly Villa and Honey Lustre of the Home and Garden Market Village. The Home and Garden Village specialises in providing a location for smaller home and garden stores – and supporting them with a very active event calednsar. We’ll be talking to Heavennly and Honey about their recent re-location, about their plans for the hioliday season … and about how delighted they are to have been nominated for several Avi Choice Awarrds! You can find out more about the Avis, and vote for your favourites here. Next Post: Prim Perfect Jigsaw – Can you find us at the Christmas Expo?